The saga began nineteen years ago. Unbreakable, released in 2000 as the follow-up to director M. Night Shyamalan’s phenomenally successful The Sixth Sense, introduced us to mild-mannered security guard David Dunn (Bruce Willis), a one-time college football prodigy. During the outset of the film, Dunn becomes the lone survivor in a horrendous train explosion and derailment. Walking away with no broken bones and the new-found ability to bench press 350 pounds with relative ease, plus an extrasensory power to see the crimes of others through touch, Dunn slowly realizes he’s a real-life, down-to-earth superhero. It was and remains one of the director’s best films. Unbreakable also introduced us to Elijah Price (Samuel L. Jackson), a man with a brilliant though neurotic mind with an obsessive interest in comic books. He was born with bones so brittle that the merest touch could result in a break. He’s spent most of his life in pain. By the conclusion of Unbreakable we find that it was Price, sometimes referred to as Mr. Glass, who orchestrated the train explosion. The film concluded with Price, considering himself a comic book mastermind, becoming institutionalized while Dunn went on to become a hooded street-walking vigilante. 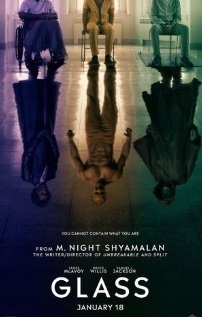 A third character named Kevin Crumb possessing 24 split personalities, the result of a traumatic childhood occurrence, was supposed to be in Unbreakable, but writer/director Shyamalan could never quite work him into the film’s overall narrative. He didn’t fit. So, Crumb was removed from the script and put on hold until sixteen years later. Shyamalan revisited the character in Split (2016) casting James McAvoy as the dangerously troubled teen. 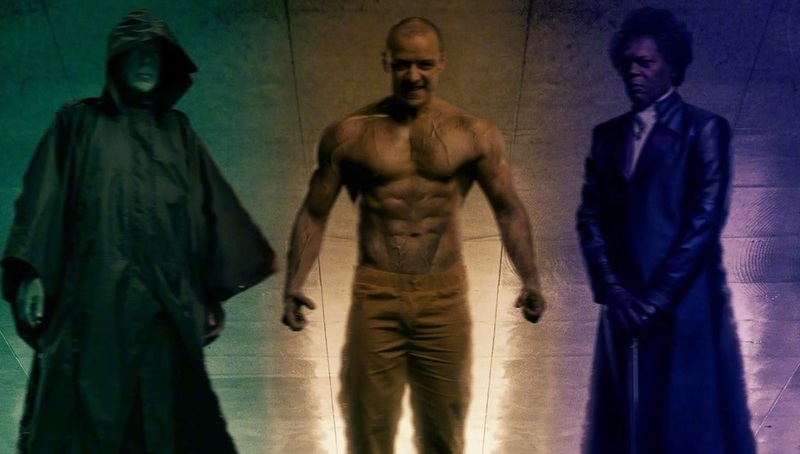 McAvoy gave a remarkable performance, as he does in this new outing, convincingly switching 23 personalities in an instant, culminating with a frightening 24th with superhuman strength known as The Beast, a dangerous supervillain who emerged out of Crumb like a murderous Hulk without the bulk. Crumb was never caught. The media dubbed him The Horde. There was no hint in Split that the film was in any way the second part of a continuing story until the brief, final scene. 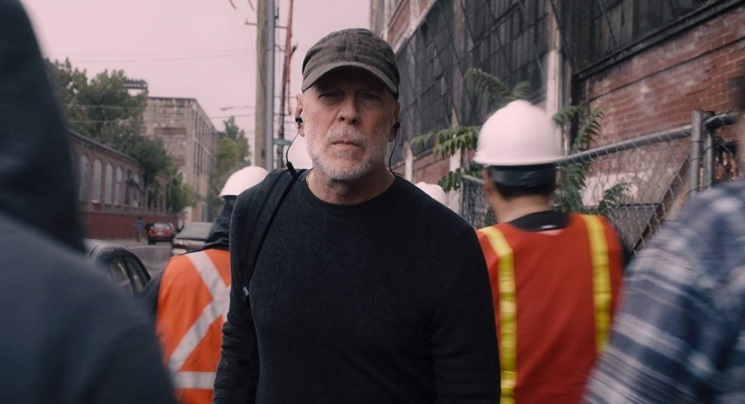 In a coffee shop, Dunn (a surprise cameo from an uncredited Bruce Willis reprising his role from Unbreakable) is listening to a conversation while seated at the counter. A woman asks a customer a question about some guy whose bones could easily break who was once in the news because of all the people he killed. What was his name again? “Mr. Glass,” remarks Dunn. And now, nineteen years after the story began, Shyamalan, having convinced Disney, who owned Unbreakable, and Universal, who owned Split, to join forces in order to have characters in both movies return for a conclusion, comes Glass. The result is a story that holds you for the first act, sags in the second, then falls apart with a ludicrous third. 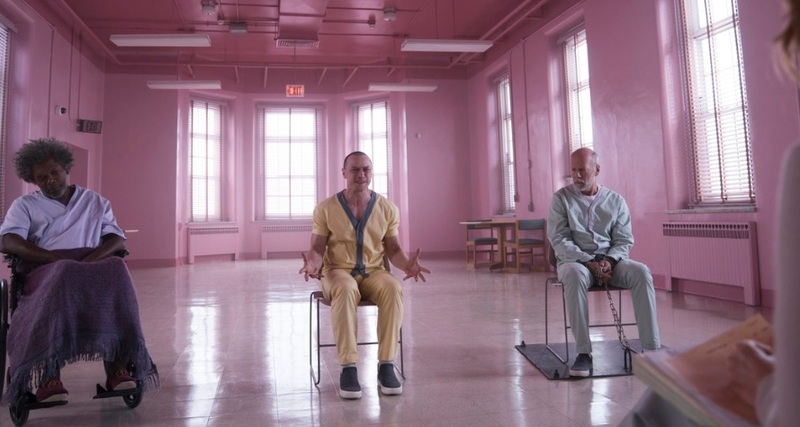 Whether he likes it or not, director Shyamalan’s name has become synonymous with twist endings, and Glass has a few of its own during that third act. As ridiculous as the film’s central reveal turns out to be, to discuss other surprises in any detail would be a disservice to the film, though it should be noted that giving an answer to Crumb’s childhood trauma and how it relates to Dunn’s vigilante act is surprisingly effective. But the whole pop-culture comic book theories as therapy and the lengthy discussions between doctor and patients and the importance of superheroes quickly becomes eye-rolling. “I believe comics are a form of history that someone, somewhere felt or experienced,” states an earnest Mr. Glass. The immediate weakness with the setup of having all three of Shyamalan’s characters incarcerated and under Dr. Staple’s supervision is that while McAvoy’s Crumb and Jackson’s Price are clearly where they should be, there’s nothing to suggest that Willis’ vigilante should be there with them. Newspapers may have dubbed him with a superhero moniker, The Overseer, but the man himself has never publicly expressed any special powers. He simply keeps in the shadows and on the lookout for wrongdoers and acts accordingly. Like the cops in Death Wish who wanted to stop Charles Bronson taking the law into his own hands, the authorities want to put an end to Dunn’s do-it-yourself vigilante tactics. As far as his strength and the power of touch to view a person’s crimes go, that’s under wraps, never talked of. In reality, after his surprise capture, a simple interview by the police would have revealed nothing other than they were dealing with a perfectly coherent, sane man who just happened to want to help in the capture of criminals. He would have probably got a sentence for interfering with the law and messing with due process, then later released under supervision with a stern warning to keep out of police business. But considering this is a Shyamalan project and no detail, no matter how initially insignificant it seems, is a wasted moment, a massive red flag on Dunn’s incarceration at a mental facility is immediately flown. 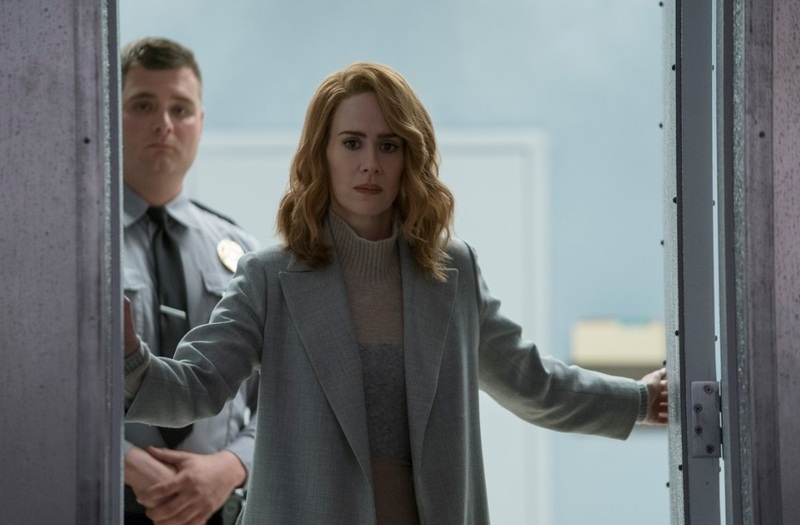 The fact that Paulson’s self-satisfied psychiatrist is lumping the man with the insane makes you suspicious of the doctor’s motives. Plus, if Dunn’s son Joseph (a returning Spencer Treat Clark, now grown) is carefully scanning the police and continually warning his dad via a radio earpiece of their whereabouts, how come there’s suddenly a whole army of armed forces, led by the psychiatrist, waiting outside of that derelict factory ready to grab both Dunn and Crumb’s ‘Beast’ the moment they emerge? Where did they come from and how did they know when to be at the abandoned building? Another bothersome question arises with the psychiatrist’s inventive technique of keeping control of Crumb’s different personality traits. Flashing lights installed in Crumb’s cell forces the man’s several personalities to instantly alter if one becomes more threatening and needs to go. Like a TV remote when changing channels, a flash of light creates a different personality to surface. When was this method discovered and at what point did the doctor and her team know it would work? Like Richard Dreyfuss’ Roy Neary in Close Encounters, you’re crying, “Who are you people?” When you eventually get the answer, you’re not buying it for a second.